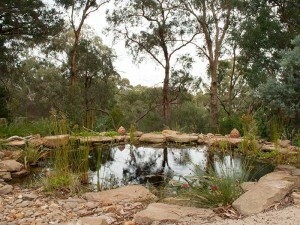 At Ben Harris Gardens, we specialise in creating beautiful ornamental garden ponds. Our garden ponds are beautiful, natural aquascapes – there is no concrete or bricks, and no sign of power leads, pipes, pumps … no visible ‘construction’ at all. All you see in your pond is water, rocks, pebbles and plants. We waterproof our ponds with a thick rubber liner, giving us the flexibility, if necessary, to change the design as we go. Gone are the days where a rock had to be concreted in – when, if you didn’t like it … well, bad luck! This flexibility allows us to create natural ponds that appear to have been there forever. As well as looking totally natural, the way we build our garden ponds and the products we use makes them easier to maintain. There’s no more fishing your pump out from the middle of the pond to clear the filter! We build ecosystem ponds, which mimic the ecological processes of natural water bodies with several key components: rocks and pebbles, plants, fish, oxygenation and filtration using beneficial bacteria. 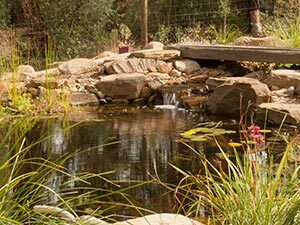 Each garden pond we build has a waterfall or stream surrounded by rocks, pebbles and, of course, plants. A skimmer filters out leaves and debris that would clog a normal pond pump, providing easy access to the plumbing while hiding it from view. But the workhorses of the ecosystem pond are the beneficial bacteria. They create a biological filter that breaks down fish waste and other matter into nutrients that the plants in the pond can use for their own growth. Of course, there are some who would prefer the look and sound of running water, but without the large ornamental garden pond to go with it. We have the perfect solution for that – pondless streams. Just some of the garden ponds designed and constructed by Ben Harris Gardens. Stream running into fish pond. Fish pond set in Japanese style garden. Large ornamental pond lit up at night.